At a time of anthropogenic ecological catastrophes, the ones most often at the forefront of climate change are populations of low-lying islands in the Pacific or ‘disposable’ working-class communities, and yet they are forgotten, not deemed worth of public mourning. Rosi Braidotti offers an alternative view: a planetary differential posthumanism, because ‘we are all in this together but we are not one and the same’ (2017). Although climate change is a planetary phenomenon affecting the physicality of our planet, climates and ecosystems, it does not affect displaced populations of low-lying islands the same way it affects continental populations, and it does not affect indigenous territories the same way it affects populations in post-imperial cities. The idea that climate change is borderless fuels a universalist and neoliberal vision of the world. This universalist fantasy fails to recognise how marginalisation is constructed and reproduced: identifying a community as ‘marginal’ or ‘vulnerable’ reinforces historical and hegemonic systems of inequality. Those communities are denied their agency; they are made marginal or vulnerable by postcolonial and neoliberal hegemonic structures. Nixon’s (2011) concept of ‘slow violence’ is useful in thinking through climate change and its postcolonial origins. He uses the example of Lawrence Summers, former president of the World Bank (1991-1993), who signed a memo proposing to export the toxic waste and garbage produced by rich nations to under-populated countries in Africa. ‘Slow violence’ is an ‘unspectacular’ violence that bypasses human lifespan; it is a gradual and insidious violence occurring out of sight and affecting primarily the ‘global South’. As Nixon explains: ‘Our media bias towards spectacular violence exacerbates the vulnerability of […] “disposable people”’ (2011, p. 4). ‘Disposable’ communities are excluded from dominant narratives, and while global warming instigates ecological catastrophes, neoliberal and postcolonial structures reinforce the disposability of certain communities. We need to formulate an epistemological strategy that conciliates the socio-environmental injustice and postcolonial discourse associated with climate change with a vision of humans as a geological force. Representing and communicating climate change thus implies taking into account its slow yet devastating violence, its planetary scale, and the postcolonial ramifications and implications it entails. How can we address the complexity, the ‘slow violence’ of climate change? And whose voices are we listening to? As a PhD student looking at the intersection of Environmental Humanities, Memory Studies, Postcolonialism and Gender Studies, I survey how climate change is constructed in society. Doing so involves researching who gets to talk about it and who is talked about. I discovered John Akomfrah’s video installations at the beginning of my research. His work allowed me to dig deeper into the interconnections between postcolonialism and environmental catastrophes. I want researchers and educators to study Akomfrah’s work to understand how climate change can be represented and formulated in art; and how voices that are made marginal, vulnerable, and disposable are essential in understanding postcolonial climate change. John Akomfrah is a British artist and filmmaker. In 1985 he co-founded the Black Audio Film Collective to examine and represent black British identity and culture. Akomfrah’s more recent work explores cultural memory and identity with a focus on ecology and postcolonialism. In 2015, he presented the first film of a quartet at the Venice Biennale. Vertigo Sea, a three-screen installation combining archival and newly shot footage juxtaposes images of whaling, migration, the transatlantic slave trade and examines, through maritime history, the interconnections of colonial exploration, industrial capitalism and climate change. Akomfrah’s use of montage brings together disparate histories, deep-water drilling, melting glaciers, colonial travels, refugee boats and brutal whaling. Purple, the quartet’s second film, was shown at the Barbican in 2017. The artist exposes on six screens archival footage with newly shot film. The piece combines images of ecological destruction, atomic bombs, poisoned rivers, Alaskan oil rigs, and intensive agriculture with archival images of non-aligned politicians Nehru and Castro, newly shot images of old photographs under a stream of water, human figures in a white raincoat facing various landscapes, people dancing, people on trains, singing and protesting. The film explores hegemonic structures regulating bodies in society, mirroring images of a black girl getting her hair straightened, fashion magazines, Grace Kelly getting married, with close-ups of people affected and afflicted by colonial and ecological violence, such as populations from the Marquesas Islands of French Polynesia and from Tahiti. By doing so, Akomfrah formulates alternative narratives. 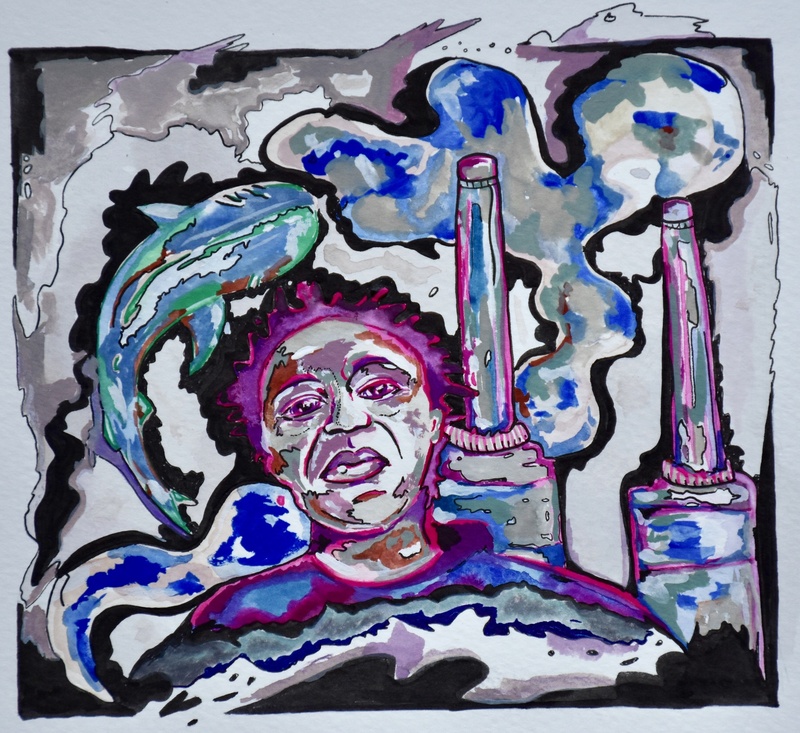 He brings to the screen images of populations who are not usually represented in gallery spaces, he allows so-called ‘vulnerable’ populations to be at the forefront of climate change discourses and exposes how they have the agency to tell their own stories. The artist weaves moments together so that colonial history, capitalist hegemonic structures and their lived inheritance become one. Akomfrah’s use of montage can sometimes feel elusive but this complexity allows the artist to represent climate change as a phenomenon anchored within human histories and geological time. He explained in an interview with The Guardian that his use of a complex layering of images demonstrates how ‘everything overlaps at some profound level, that the great shifts in human progress that are made possible by technology can also cause the profoundest destruction and suffering’ (2017). As Heise (2010) suggests, juxtaposition produces a kind of epistemological synergy bringing different discourses together without erasing or diluting their complexity. Akomfrah combines portraits of Tahitian women with archival images of atomic bombs and acid rains, doing so he broadens our understanding of environmental disasters and embed it within a larger postcolonial discourse. The significance of Purple also lies in its autobiographical quality. John Akomfrah grew up in the shadow of Battersea Power station in South London; every day he played in the streets he was being unwittingly poisoned by the carbon dioxide emanating from the iconic chimneys. Purple is about revisiting that moment, and inscribing it in a wider socio-environmental context. Through his work, Akomfrah gives a voice to his working-class background along with communities that are made vulnerable by climate change all over the planet. His work provides a narrative in which the identities, memories, and struggles of some marginalised groups are recorded and given prominence. In a time of ecological catastrophes and political uncertainty, art can give us a sense of connection to our planet and a sense of solidarity with human and non-human life forms. Akomfrah’s video installations should not solely belong to the gallery space, their meticulous composition should be studied in Art History and Film Studies courses. The intricate mosaic of discourses that Akomfrah creates should also be presented in Postcolonial Studies courses as well as in Environmental Humanities programmes. Akomfrah’s works reveal how planetary solidarity needs to be differential and adding them to a university curriculum would allow students and researchers to consider climate change using an intersectional approach. Postcolonial narratives are crucial in understanding the cultural significance and the physical implications of anthropogenic climate change; John Akomfrah’s work provides a salutary and complex narrative that confronts hegemonic universalist and neoliberal structures regulating societies. Akomfrah, John. Vertigo Sea. 2015. Whitworth Art Gallery. John Akomfrah / Smoking Dogs Films. Akomfrah, John. Purple. 2017. Barbican Centre. John Akomfrah / Smoking Dogs Films. Braidotti, Rosi. ‘Are “WE” in this together.’ 2017. Keynote Lecture at the Institute of Advanced Studies, UCL. Butler, Judith. Precarious Mourning: The Powers of Mourning and Violence. London: Verso, 2004. Crutzen, Paul and Stoermer Eugene. ‘The Anthropocene’. 2000. IGBP Newsletter 41(17). pp17–18. Heise, Ursula. ‘Afterword: Postcolonial Ecocriticism and the Question of Literature.’ Postcolonial Green: Environmental Politics and World Narratives, edited by Bonnie Roos and Alex Hunt, U of Virginia P, 2010. pp 251-58. O’Hagan John. ‘Interview John Akomfrah: “Progress can cause profound suffering.”’ The Guardian, 1 October 2017, www.theguardian.com/artanddesign/2017/oct/01/john-akomfrah-purple-climate-change. Accessed 8 March 2018. Klein, Naomi. This Changes Everything: Capitalism vs. the Climate. New York: Simon and Schuster, 2014. Demos, T.J., Logsdail, Nicholas, Alter, Nora M. John Akomfrah. London: Lisson Gallery Publication, 2016. Clara de Massol is a LAHP-funded PhD candidate at King’s College London in the department of Culture, Media and Creative Industries. Clara’s doctoral research investigates how memorial practices are formulated in the Anthropocene: she surveys cultural responses to climate change and their attention to memory to understand how climate change transforms our perception of the past, present and future and how new memory paradigms emerge to accommodate the theoretical particularities of the Anthropocene. Her project explores what happens when environmental literary criticism is applied to non-literary forms, to demonstrate the value of the humanities in increasing our collective ecological consciousness.